This paper attempts to adjust labor input for quality change over time, and quantify its impact on the TFP growth estimates, in six South Asian countries, i.e. Bangladesh, Bhutan, India, Nepal, Pakistan, and Sri Lanka, covering the period of 1970–2015. This work requires employment data differentiated into labor categories and their corresponding wage estimates for each of these countries. The database we compile are country's employment and wage matrices cross-classified by four attributes, namely, gender, education, age, and employment status. Our findings suggest that it is significant to account for labor quality change. 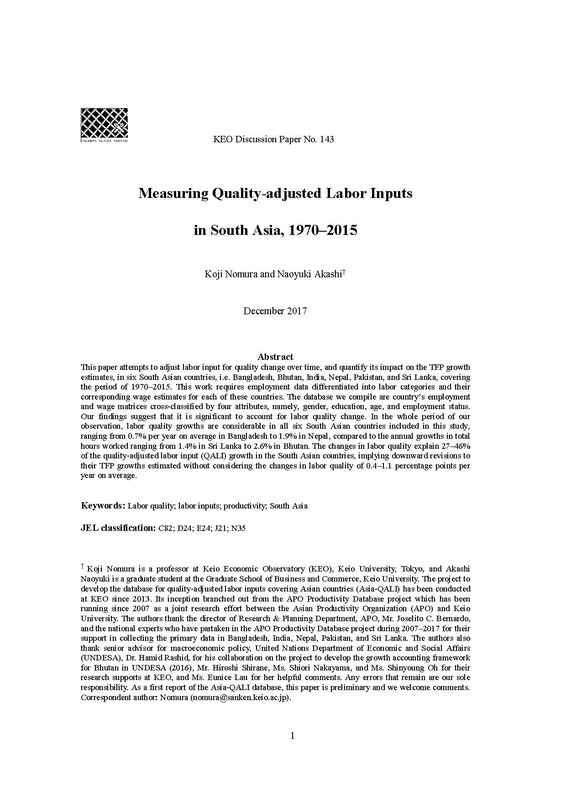 In the whole period of our observation, labor quality growths are considerable in all six South Asian countries included in this study, ranging from 0.7% per year on average in Bangladesh to 1.9% in Nepal, compared to the annual growths in total hours worked ranging from 1.4% in Sri Lanka to 2.6% in Bhutan. The changes in labor quality explain 27–46% of the quality-adjusted labor input (QALI) growth in the South Asian countries, implying downward revisions to their TFP growths estimated without considering the changes in labor quality of 0.4–1.1 percentage points per year on average.